I’ve been making lasagna for years. It’s a dish I grew up with; it made frequent appearances at our dinner table and was a good standby at potluck dinners. I don’t know if I ever asked for a recipe from my mom, or after watching her make it countless times I just figured it out. It’s great for Sunday dinner because you will inevitably have leftovers – unless you’re really hungry or feeding a crowd – and it’s nice to have at least one planned leftover for the week. My friend Justin has been asking me for months to teach him how to make lasagna. I can’t remember the origins of the conversation, but I suspect it has something to do with him perhaps not entirely believing I can cook. Regardless, I did promise the guy I would show him how easy it is to make the most comforting, cheesy deliciousness that is lasagna. After some back and forth, we settled on a date and he even wrote it in his calendar. And I doubted his commitment to cooking. Before Justin and his entourage of hungry men came over, I had a slight panic attack. I’ve never written down a recipe for lasagna. I just wing it. And it turns out wonderful each time. 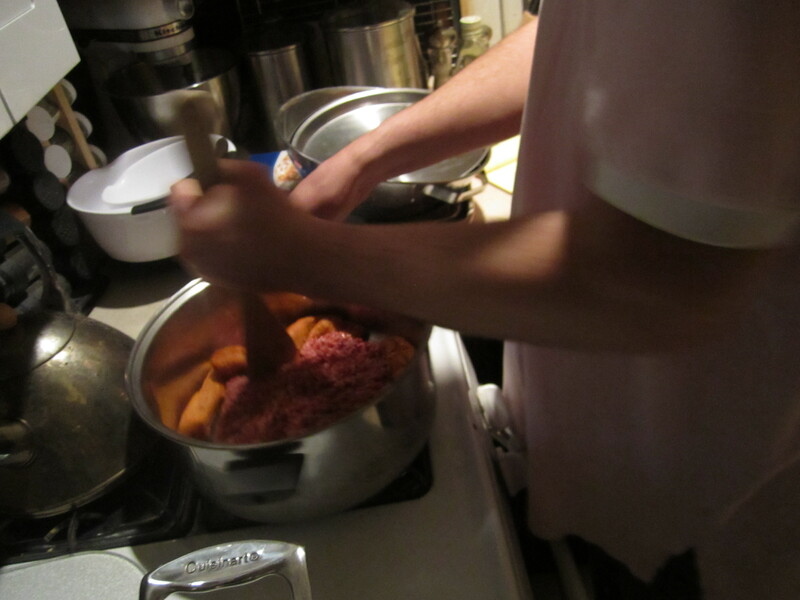 I come from the “It’s hard to mess up a pot of Bolognese” school of thought, but still, I knew he would need a recipe. I trolled the Internet for lasagna recipes; I needed to know that what I had cobbled together by memory was pretty close to what epicurious.com and the Food Network would show me. I pick those two websites, not because I like their recipes all that much, but it’s easy to find basics and build from there. I was on the right track, or at least close enough. A couple of recipes called for cottage cheese instead of ricotta. Now, I am no culinary purist by any stretch of the imagination, but that is something I will not use in lasagna. You can if you want to. I believe that ricotta has a smoother, richer taste. 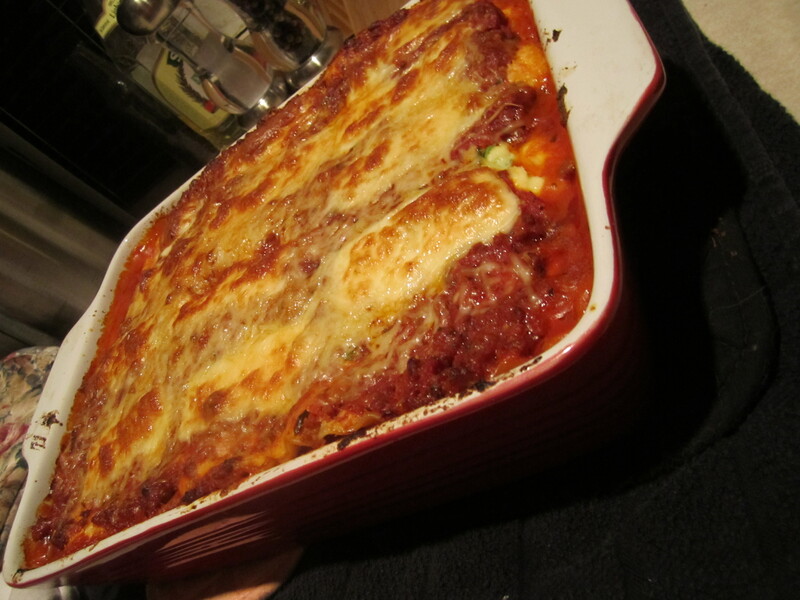 And yes, you can purchase low fat ricotta and the lasagna will still be delish. I also consulted the new edition of “The Joy of Cooking”, and found its recipe for Bolognese Sauce to be superior to what I planned to use. I didn’t have pancetta in the house; otherwise I would have considered using it. But my worry slowly subsided. I’ve made the roughly the same “recipe” when I’ve made lasagna for years. No one has ever complained that it wasn’t meaty or cheesy enough. If anyone hasn’t liked it, they’ve never told me. I called my friend Stephanie over, as I put it, “I may need you to regulate. I have no idea what to expect.” She arrived with two beers in hand. The lasagna was a hit and Justin proved that he’s no slouch in the kitchen. For those of us who do cook, there is a prideful feeling we get when we teach someone how to make something we love. In a large skillet, or saucepan, combine ground beef, Italian sausage (remove from casings) and minced garlic. Cook over medium-high heat until browned. Drain ¾ of the fat. Add tomatoes, tomato paste, parsley, basil and salt. Mix well and turn down heat to medium low. The sauce should simmer for about 30-35 minutes. Add lasagna noodles to boiling water and cook until al dente, about 7 minutes. Strain noodles. If you would like, you can sprinkle the noodles with a small amount of olive oil to prevent sticking. Otherwise, just hang the noodles over the edge of the colander. In a medium bowl, mix ricotta, beaten eggs, Parmesan, remaining parsley and 1 teaspoon salt. Mix with a wooden spoon or rubber spatula. Gently stir in baby spinach, if you’re using it. 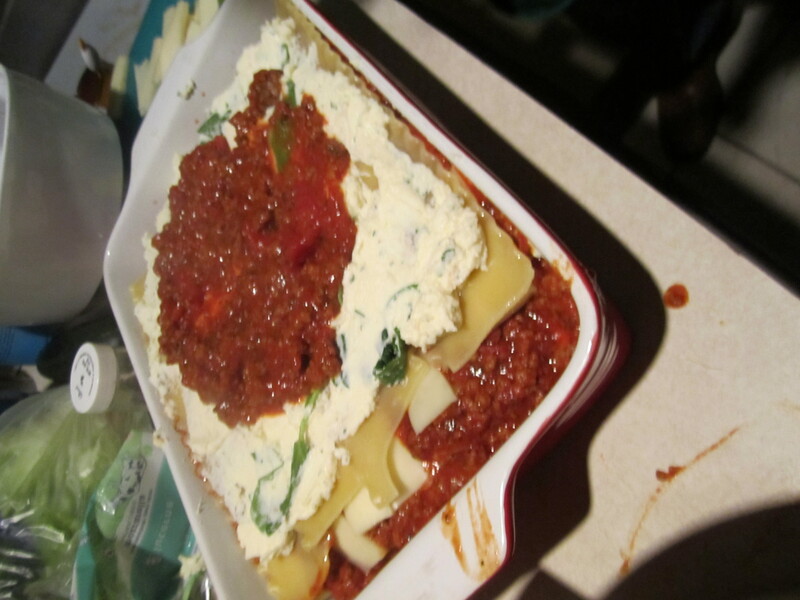 Arrange 4 cooked lasagna noodles in the bottom of a 9 X 13 baking pan, overlapping if necessary. Spoon half the cheese mixture over the noodles. Spread evenly. Spoon a little less than half of the meat sauce on top of the ricotta. Next, sprinkle a layer of grated mozzarella. (Note: we used sliced mozzarella based on the recommendation of someone who shall remain nameless. Either pony up the cash for grated mozzarella or use a grater. A food processor will get the job done nicely, too.) Repeat steps, ending with meat sauce mixture. Sprinkle generously with extra Parmesan. Bake for 30-35 minutes, until the top is hot and bubbly. Let stand for 15 minutes before you serve it. Justin browning beef and Italian sausage. Hot bubbly goodness. Let it sit for about 15 minutes so it all sets up. It's worth the wait! Hi Lia: Just stopped through to say hello and that I’ll be glad to meet you at the next Front Range Foodies meetup. It’s been a long time since I’ve made lasagna. It looks good.